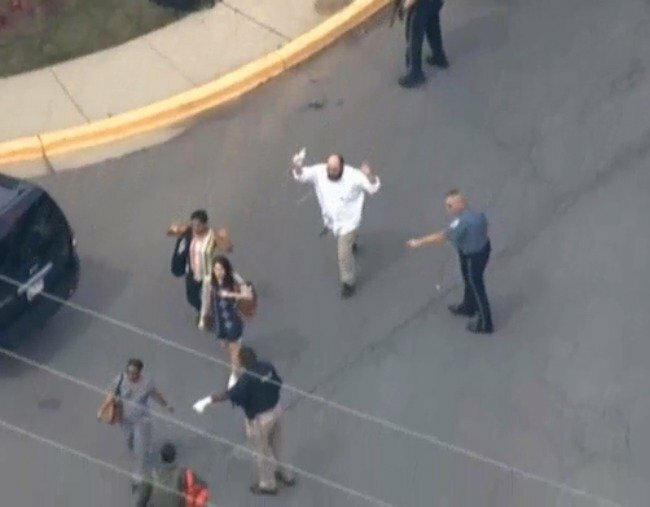 Five people killed in Maryland shooting at Annapolis newspaper. Five people have been killed after a gunman opened fire at a US newspaper office. A gunman has fired through a glass door at a newspaper office in the US city of Annapolis spraying the newsroom with gunfire and killing at least five people and injuring several others, authorities say. The suspect has been apprehended and no motive is known for Thursday’s attack at the Capital Gazette office in the Maryland capital city, local political leaders say, adding they believe he acted alone. Phil Davis, who identified himself as a courts and crime reporter at the Capital Gazette, which runs multiple newspapers in its Annapolis office, tweeted that multiple people had been shot. Davis said in an interview with the Baltimore Sun, which owns the Gazette, that he and others were still hiding under their desks when the shooter stopped firing. One law enforcement source told CBS News the suspect is a male in his 20s who had no identification on him. Two law enforcement sources told CBS News the suspect used a shotgun and CNN reported he was not being cooperative with police. Davis later said he was safe and being interviewed by police. The daily newspaper and sister publications has an editorial staff of around 45 supported by a sales and advertising team of about 10 staff, according to the company’s website. Police said they were on the scene in about a minute from the initial call about the shooting. Police went to the offices of the Baltimore Sun as a precaution, that paper reported. “We’re deploying units from our Critical Response Command to news outlets throughout New York City,” said Officer Andrew Lava, an NYPD spokesman. “There is no active threat at this time,” he said. Live video images showed people leaving the building, walking through a parking lot with their hands in the air. Scores of police vehicles were on the scene.